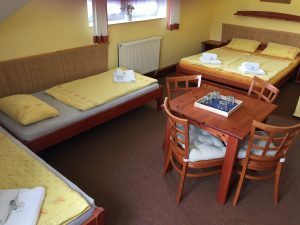 Our hotel offers accommodation in the mountain range of Beskydy in a pleasant/luxurious wellness centre at the join of towns Zlín and Vsetín. The hotel standing between the towns of Zlín and Vsetín offers not only accommodation in pleasant environment, but also the possibilities of massages, whirlpool, sauna, relaxation, rest, hiking, cycling, skiing, cross-country skiing trails, and many more attractive options of spending leisure time adequately. We offer a complete service concerning the organizing of private meetings. We will arrange trainings, company meetings, lectures and seminars, and naturally also weddings and other family and social meetings. Everything – including the accommodation for the participants – will be provided in our hotel Sirákov. 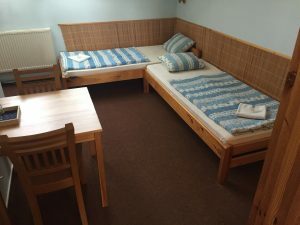 V období od 24.12 do 2.1 cena ubytování: 800.-Kč/osoba noc bez snídaně. 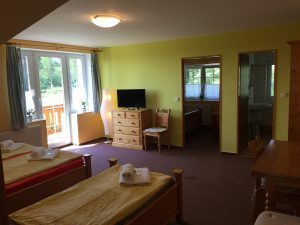 In the Hotel Sirákov near the town of Vsetín, we offer accommodation for up to 32 people in rooms equipped by a TV and SAT and, naturally, with an own bathroom and toilet. Wi-Fi is available free of charge in the whole hotel. Owing to its strategic position, the hotel is a splendid base for the guests who want to enjoy hiking or cycling. Trails of variable difficulties are available – for both families with children and high-performance sportsmen. The hotel offers room for up to 70 people for all sorts of celebrations, parties, promotions, lecturing, wedding feasts and other private or company meetings. Sportsmen will enjoy the stay in winter, too, as there are plenty of cross-country ski trails with wonderful views of Walachia nature from the hills surrounding the Hotel Sirákov. The hotel itself offers a great variety of sport activities. A playground intended for tennis, volleyball, leggball, football and badminton with the surface of artificial grass and silica sand is available for the guests; and it is situated just next to the hotel. The hotel Sirákov is conditioned for active rest and – at the same time – for relaxation and recreation owing to its favourable position between the towns of Zlín and Vsetín, the pleasant accommodation, and its wellness centre. Our skilled cooks will take care of your taste buds. The leading delicatessens among our specialities are made from oyster mushroom. You can choose from a variety of complete main courses (daily many or order-made) and specialities which are regularly changed. We are particular about the freshness of our ingredients, their careful processing, and also about the altering of our menu in dependence on the availability of some fresh foods. We just do everything for our visitors’ absolute taste pleasure. Our own smokehouse is always ready. Delicate smoked bratwursts, ribs and more high-quality meat or fish will definitely delight not only singe persons, but also all the participants of any social meetings.